Lake Chad (in French: Lac Tchad) is a large, shallow lake in Africa. It is economically very important, providing water to more than 20 million people living in the four countries which surround it — Chad, Cameroon, Niger and Nigeria. It is located mainly in the far west of Chad, bordering on northeastern Nigeria. 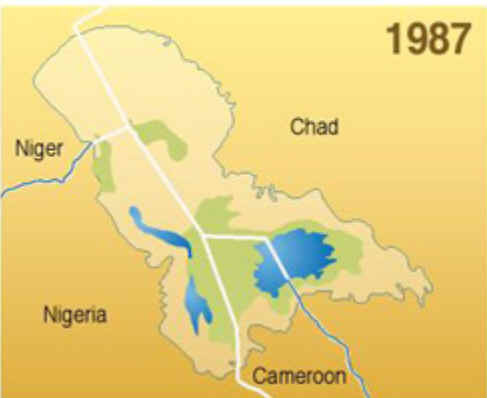 The Chari River is its largest source of water, providing over 90% of Lake Chad's water. The lake possesses many small islands and mudbanks, and its shorelines are largely composed of marshes. Because it is very shallow — only 10.5 metres (34 ft) at its deepest — its area is particularly sensitive to small changes in average depth, and it consequently also shows seasonal fluctuations in size. 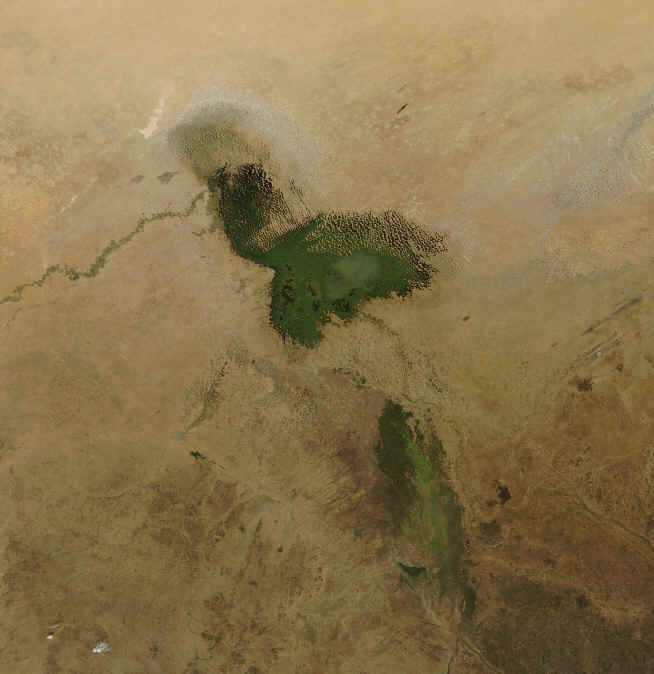 Lake Chad has no apparent outlet, but its waters percolate into the Soro and Bodélé depressions. 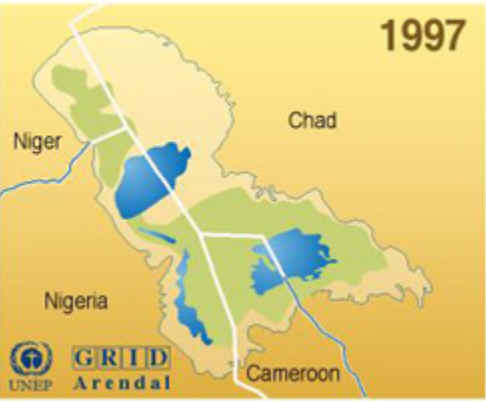 Lake Chad gave its name to the country of Chad. The name Chad is a local word meaning "large expanse of water," in others words simply "lake." 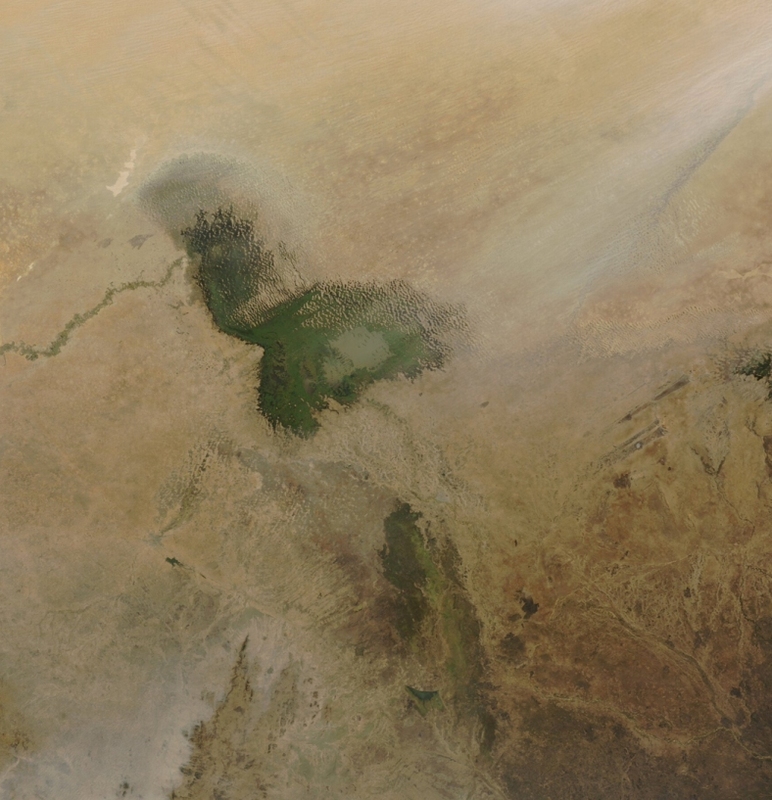 According to fossil evidence, Lake Chad has probably dried out half a dozen times in the past 1,000 years. Scientists attribute the latest shrinkage to droughts and increased irrigation. Lake Chad, once one of the African continent's largest bodies of fresh water, has dramatically decreased in size due to climate change and human demand for water. 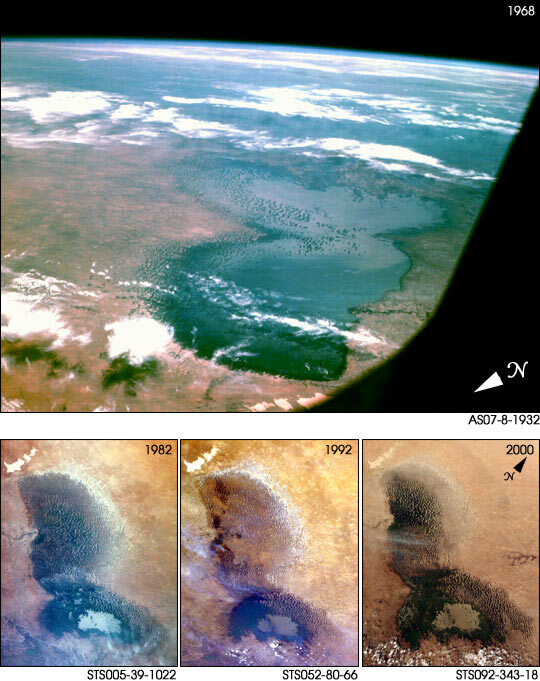 Once a great lake close in surface area to North America's Lake Erie, Lake Chad is now a ghost of its former self. According to a study by University of Wisconsin- Madison researchers, working with NASA's Earth Observing System program, the lake is now 1/20th of the size it was 35 years ago. Found at the intersection of four different countries in West Africa (Chad, Niger, Nigeria and Cameroon,) Lake Chad has been the source of water for massive irrigation projects. In addition, the region has suffered from an increasingly dry climate, experiencing a significant decline in rainfall since the early 1960's.The most dramatic decrease in the size of the lake is shown in the fifteen years between January 1973 and January 1987. Beginning in 1983 the amount of water used for irrigation began to increase. Ultimately, between 1983 and 1994, the amount of water diverted for purposes of irrigation quadrupled from the amount used in the previous 25 years. The red color denotes vegetation on the lake bed and the ripples on the western edge of the lake denote sand dunes formed by the wind. NASA-funded researchers using computer models and climate data now understand why Africa's freshwater Lake Chad has been disappearing over the last 30 years. Michael T. Coe and Jonathan A. Foley of the University of Wisconsin-Madison cite a drier climate and high agricultural demands for water as reasons why what was once one of Africa's largest freshwater lakes is shrinking. 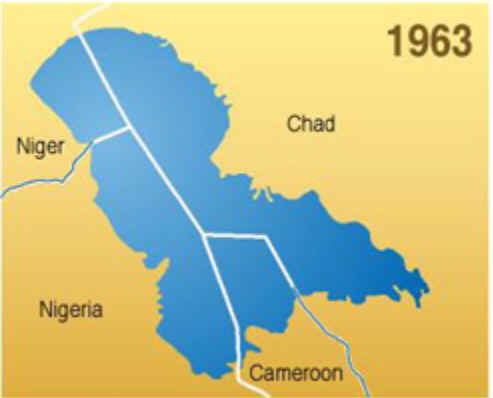 "Lake Chad was about 25,000 square kilometers in surface area back in 1963," Foley noted. Now the lake is about one-twentieth the size it was in the mid 1960s. Their paper titled "Human and Natural Impacts on the Water Resources of the Lake Chad Basin," was published in the American Geophysical Union's Journal of Geophysical Research. In their paper, Coe and Foley used an integrated biosphere model (IBIS) with long time-series climate data. 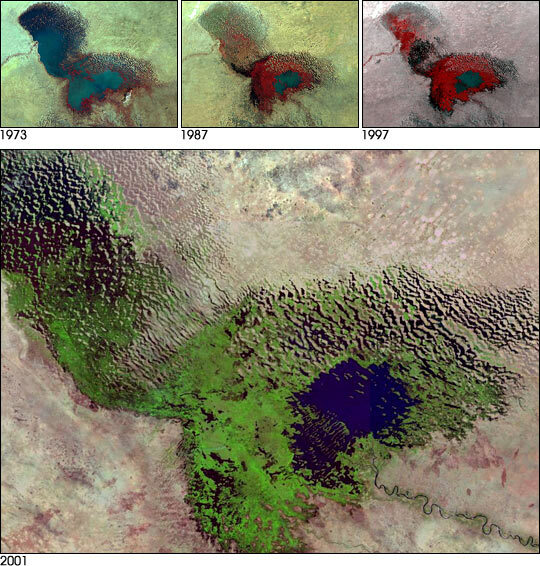 They simulated the exchange of energy, water and carbon dioxide between vegetation, soil and the atmosphere, and tracked the changes in Lake Chad since 1953. They input the data from the biosphere model into a hydrological model and were able to estimate changes in river discharge, the amount of water in wetlands and in Lake Chad. Using model and climate data, Coe and Foley calculate that a 30 percent decrease took place in the lake between 1966 and 1975. Irrigation only accounted for 5 percent of that decrease, with drier conditions accounting for the remainder. They noticed that irrigation demands increased four-fold between 1983 and 1994, accounting for 50 percent of the additional decrease in the size of the lake. 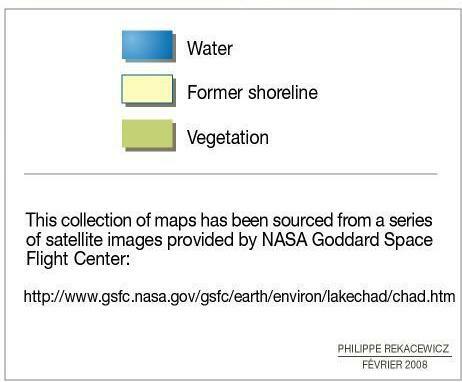 "NASA Landsat satellite imagery taken of the lake over the last 30 years really capture the model conclusions and visualize them very well," the researchers noted. 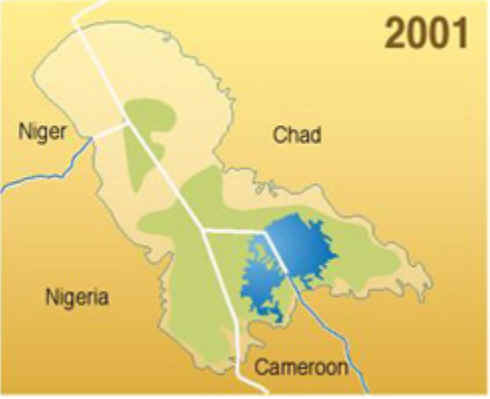 Lake Chad and the Chari/Logone river system, which transports 90 percent of the runoff generated in the area basin, are important water resources for the local population. The lake is 820 feet (250 m) above sea level and is shared by Chad, Cameroon, Nigeria and Niger. 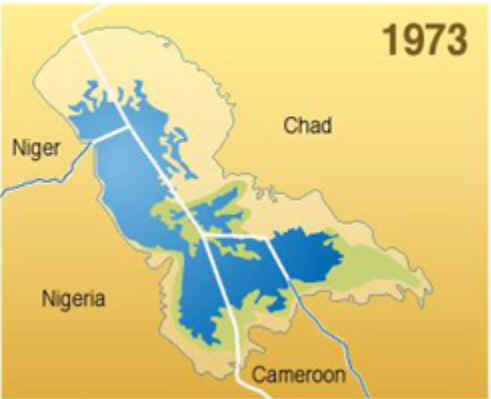 Lake Chad has always undergone seasonal and inter-annual fluctuations because it is less than 23 feet (7 m) deep. In recent decades, during wet periods the lake expands up to 10,000 square miles (25,900 square km). The warming climate and increasing desertification in the surrounding Sahel region have dropped water levels far below the average dry season level of 4,000 square miles (10,000 square km) to only 839 square miles (1,350 square km). The Northern Africa Sahel region has experienced numerous devastating droughts over the last three decades. "Climate data has shown a great decrease in rainfall since the early 1960's largely due to a decrease in the number of large rainfall events," Coe said. Lake Chad's primary source of water comes from the monsoon rains that typically fall in June, July and August. Meanwhile, the use of water for irrigation has increased, in response to the drier climate. Over the last 40 years, the discharge from the Chari/Logone river system at the city of N'Djamena in Chad has decreased by almost 75 percent, drastically reducing the input into the lake. Between the increase in agricultural water use and the drier climate, there has been a massive decline in the amount of water in Lake Chad. With a drier climate and less rainfall, agricultural areas become more desperate for water to irrigate their crops, and will continue draining what is left of Lake Chad. Foley said, "The problem is expected to worsen in the coming years as population and irrigation demands continue to increase." Regional officials have noticed the dramatic effect the shrinking lake is having on its surrounding inhabitants.